John Faso, left, and Antonio Delgado. 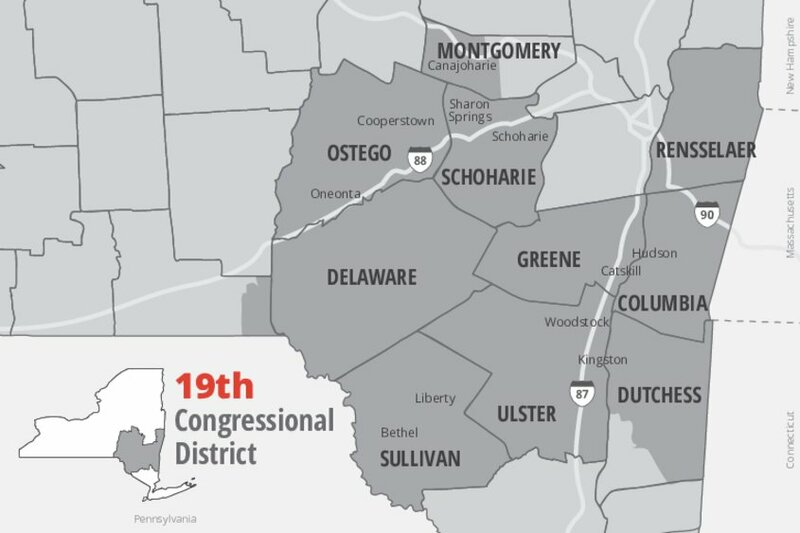 19th CONGRESSIONAL DISTRICT — If a "blue wave" is going to hand control of the House of Representatives over to the Democrats nationally, the race for the 19th Congressional District is one that could facilitate the power shift. In a contest drawing national attention, the 19th is where Republican incumbent John Faso, of Kinderhook, is fighting for a second term against a challenge from Democrat Antonio Delgado, of Rhinebeck. At this point, the race looks like a dead heat. "Barnburner. Nail biter. Photo finish. Pick your phrase and buckle up, because this race is going right down to the wire," said Siena College pollster Steven Greenberg last week, after a Siena poll showed Faso leading by a single percentage point: 44-43 percent. The men are a study in contrasts: Faso, 66, is an attorney from rural Columbia County who has spent decades in and around state politics and was the GOP candidate for governor in 2006. He worked as an attorney/lobbyist for a high-profile New York law firm for more than a decade before his congressional run. Delgado is also an attorney, but he is black and grew up in a working-class family in Schenectady. This is his first bid for public office. Delgado, 41, graduated from Bishop Gibbons and became a Rhodes Scholar before attending Harvard Law School. He has tried to tie Faso to President Donald Trump's efforts to repeal the Affordable Care Act and a tax bill (that Faso ultimately opposed) that cut taxes most for corporations and the wealthy. Delgado himself has called for expanding health care coverage. "My goal is to get us to universal coverage as fast as possible, and the best way to do that is by creating a public option, giving everyone the choice to opt into Medicare," Delgado said. Faso said he opposes a public option for health care coverage. "John is working to reform our health care system with commonsense solutions that will improve the quality of the care we receive, lower costs, increase transparency and allow families, not the government, to make decisions about their care," states a message to voters on his campaign website. It is a contest that has seen conservative national political action groups spend more than $2 million, much of it on television ads attacking Delgado over music he made during a brief career as a rap artist. Delgado, on the other hand, has raised more money than Faso. Through Sept. 30, he had raised $6.6 million and spent more than $4.8 million, according to Federal Elections Commission filings. Faso had raised $3.3 million and spent just over $2 million. The 19th is the only local race in which Trump has weighed in, with a tweeted endorsement of Faso. Former vice president Joe Biden has appeared on behalf of Delgado. The district, which stretches from the mid-Hudson Valley to Schoharie, Montgomery and Rensselaer counties, has 152,792 enrolled Democrats, 147,025 enrolled Republicans, and 125,329 independent voters, according to state Board of Elections figures. In addition to the Republican ballot line, Faso has the Conservative, Independence and Reform lines. Delgado has the Democrat, Working Families and Women's Equality lines. Also in the race are Green Party candidate Steven Greenberg and actress Diane Neal, who is running as an independent.